Do you want to take care of your new hardwood floors so that they last a lifetime? (They can with the right care, by the way!). Simply keep them free of dust and debris, no wet mopping, and no harsh chemicals. “Less is more” is the best rule of thumb! Now that you know what to do, let’s talk about what not to do to your hardwood floors to keep them looking pristine. While using a vacuum is physically easier to use when cleaning hardwood floors than a traditional broom or dry mop, vacuums can oftentimes damage the surface of your floors. To avoid this, do not use the beater bar on the vacuum because that can scrape and dent your floors. Also, vacuums can create denting if dropped. 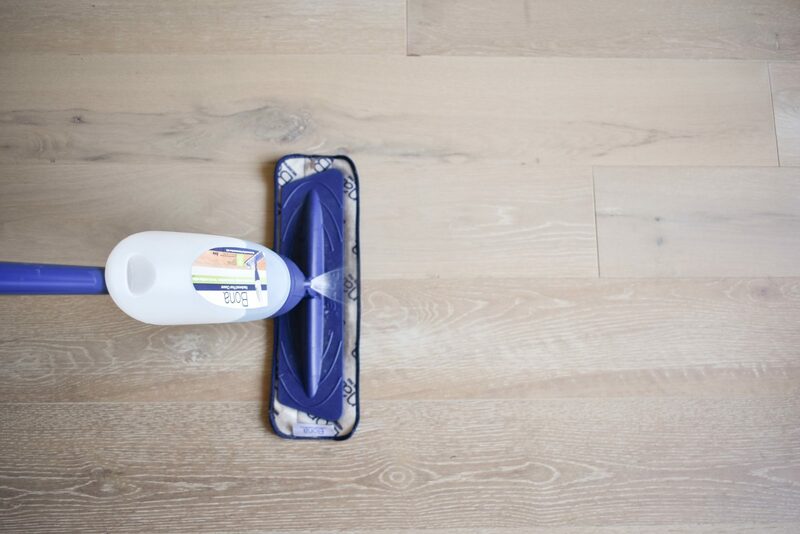 Using a dry mop with little moisture is one of the best ways to dust your hardwood floors. Bona Floor Care has a product which is gentle and ideal for Emily Morrow Home hardwood flooring that removes the dust and debris of everyday life. No harsh chemicals, furniture polishes, or wood waxes should ever be applied to Emily Morrow Home’s hardwood floors. Additionally, wet mopping your hardwood floors can lead to long-term water damage due to the overexposure to moisture on the porous wood*. A better option would be a dry mop or Swiffer mop. Try to avoid walking on your hardwood floors with high heel shoes. High heels create a lot of pressure in a small area which can create indentations on the hardwood floors. If you move any furniture, use soft gliding pads underneath to reduce any scratches or indentations. Otherwise, if you move furniture, pick up the furniture completely off the floor and gently place it back on the hardwood in the desired location. Do not drag or scoot furniture across your hardwood floors. The Emily Morrow Home hardwood collection is pet-friendly, and our durable construction proctects against most everyday scratches that your excited pooch or feline might inflict upon your floors. With our UV cured Aluminum oxide finish, our hardwood floors can stand the test of your pet’s “Scooby-Doo” moments. We caution you, though, in remembering that long exposure to moisture can damage hardwood floors. So, if your sweet angel has an accident or spills his or her water bowl onto your floors, you will want to wipe it up as soon as possible. Hardwood flooring is strong and tough, and it can last a lifetime with proper care and maintenance. We hope these simple care and maintenance tips will keep your Emily Morrow Home hardwood floors looking gorgeous for years to come.